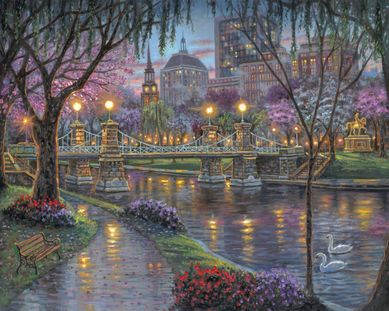 Home | New Releases | Robert Finale Artist Signed Limited Edition Hand-Embellished Giclee on Canvas:"Boston, Lagoon Bridge"
Robert Finale Artist Signed Limited Edition Hand-Embellished Giclee on Canvas:"Boston, Lagoon Bridge"
Size: 9" x 12", 18" x 24", and 24" x 32" - Select sizes options from Drop Down Box. Edition: Artist Signed and Numbered, Limited to 64 total. Certificate Of Authanicity Included. About the Artist: Robert Finale uses his photographs, sketches and memories simply as the starting point, an inspiration on the journey to the creation of each masterpiece. He is no stranger to struggles and adversity. At the tender age of two, he along with his family fled the communist ruled country of Cuba for a life of freedom and opportunity in the United States. Here Robert learned the value of hard work and discipline and realized his potential to pursue his passion for art. This passion, Finale explains, began very early in life. As a young boy of five, Robert Finale was seldom without a pencil and sketchpad in hand, sketching everything from movie scenes to family vacation destinations. Robert's love for brushing oil onto canvas came much later, when his early childhood sketch were brought to life in a special gift to his wife. From humble beginnings, today his paintings grace several Galleries all over the world. Home | Fine Art Prints & Limited Editions | New Arrivals | Robert Finale Artist Signed Limited Edition Hand-Embellished Giclee on Canvas:"Boston, Lagoon Bridge"
Home | Serigraphs and Giclee Fine Art | Robert Finale | Robert Finale Artist Signed Limited Edition Hand-Embellished Giclee on Canvas:"Boston, Lagoon Bridge"